The more I think about Solo: A Star Wars Story, the better the film gets in my mind. The one part that unfortunately does not click with me is Emilia Clarke’s portrayal of Qi’ra. Luckily, we’ve got Most Wanted to try and fix that. In this new YA novel by Rae Carson, we follow a young Han and Qi’ra about a year before the film starts. When Lady Proxima sends them on a mission that goes south, they must learn to trust each other in order to elude the clutches of criminals, the Empire, and their own boss. 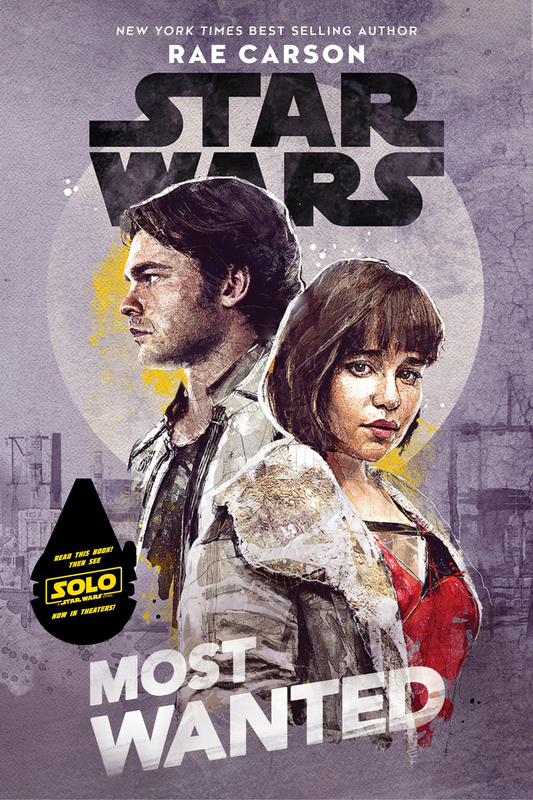 Can this book give us some extra insight into the characters of Han and Qi’ra and thus deepen the film? In short, yes. We learn a lot about their youth on Corellia, and about the planet itself. This really shines a new light on the opening sequences of the movie, and on the characters’ motivations. Seeing as we’ve already been in Han’s mind many times – even if it is at a later age – Qi’ra benefits from this the most. In Solo, it’s hard to get a read on her, mostly because the movie doesn’t really want us to. Most Wanted, however, dives into her character and shows us a pragmatic young budding businesswoman with a heart of gold. A seemingly new take on the character, but one that’s perfectly in line with how Emilia Clarke plays her. Besides Han and Qi’ra, there’s a third main character that is worth mentioning: Tsuulo. This Rodian is one of the youngsters that’s stuck running errands for the White Worms with Han and Qi’ra. Even though he doesn’t speak a word of Basic, he instantly becomes one of the highlights of the book. His lack of communication skills is alleviated by Han translating his witty remarks. Because of this, Tsuulo takes on the role that Chewbacca normally fills. But he’s enough of his own character to make the dynamic between the three main characters feel fresh. There’s a few other recurring characters present. Lady Proxima, Moloch and Rebolt are ones we know from the movie. And there’s a few new ones, like Tool, Powlo, and the mysterious Engineer. They all fill their roles in the story admirably, but none of them really get fleshed out beyond a line or two of backstory. The emphasis is clearly on Han, Qi’ra and the thrilling sense of adventure. The story is relatively standard fare, and somewhat predictable to boot. A couple of rookies in the criminal underworld grow closer in the face of adversity when a deal goes bad… much like we see in the film. In that sense, a simple story doesn’t necessarily have to be a downside. Just as in Solo, we already know where the characters will end up. It’s mainly about how they reach that end, and thankfully the ride there is wholly entertaining. Most Wanted, it turns out, is a perfect echo to Solo: A Star Wars Story. The film has little depth or substance to think about, but it does slightly change the way you look at the rest of the saga. The book has little depth or substance to think about, but similarly changes the way you go see Solo. And both of them are plain old heaps of fun. What more could we ask for?